The 2014 Sudbury Fitness Challenge is now officially in the books. It was a very successful year for the series which saw a significant increase to the depth of the fields in almost every category. It is clear from the many tight races for age group and overall titles that folks are beginning to pay attention to the points and standings. More people than ever before completed all 6 of the events in the series. Some of them were chasing the points, others were using the events as motivation to keep their fitness goals going all year long and a few brave souls took it as an opportunity to expand their comfort zones and try new activities altogether. There is no doubt that the race for the overall women’s title was the closest (and most closely watched) competition this year. It started with a number of very strong contenders vying for the title but by the time that the final event (The Turkey Gobbler) rolled around it was evident that the field had been whittled down to two. Amanda Kosmerly toed the start line with a ridiculously slim 2 point lead over the defending Ms. Fit Sudbury, Sara McIlraith. Sara was able to defend her title for the 5th year in a row by running to a strong 2nd place finish over the hilly, slippery 8km cross country course. Her final point total for the year was 6967 points. The men’s overall title was not quite as close as the women’s but the depth was even greater with 4 men having a crack at top spot. Todd Withers, Colin Ward and Kerry Abols were all sitting within 200 points of the leader Buddy Green…..and all four of them showed up to duke it out at the final event. Once again, 2nd was good enough to win as Kerry Abols ran his way to a strong 2nd place in the Turkey Gobbler and earned enough points to claim the overall Mr. Fit Sudbury title. Making his win even more impressive was the fact that Kerry was not able to participate in the Island Swim this year and so he only scored points in 5 of the 6 events. There was no shortage of impressive performances in the age group competitions this year either. The depth and calibre of the age groupers was a sure sign that the Sudbury Fitness Challenge is gaining momentum. Emily Marcolini easily defended her 13-19 yrs Ms. Fit title despite missing the Island swim due to a conflicting running event. She finished 4th overall, just missing the 6000 point mark. Julie Rathwell topped the 20-29yr category with consistently strong finishes in all 6 events and Tamara Flannigan captured the 30-39yr title. Tamara had been challenging Sara and Amanda all year long for the overall top spot but the final running event proved to be the Achilles heel of the swim star. She ended up finishing a strong 3rd overall and became only the 3rd person in the modern era to crack the 6000 point barrier. Special mention goes out to Laurel Myers. Laurel took up the challenge to compete in all six of this year’s events and to write about her experiences. She easily met her goal despite having little or no previous competitive experience in several of the disciplines. She approached all of the events with a great attitude and personified the spirit that the Fitness Challenge was designed to inspire. Laurel ending up finishing 3rd in the women’s 30-39 yr category. We look forward to seeing her out again next year. The 40-49 women’s age group was a two woman battle from start to finish as the top two overall women came out of this group. It was great fun to watch these two fantastic master’s athletes compete against each other while showing all of the younger racers a thing or two about endurance sport. They both smashed the 6000 point barrier. The support that they showed each other and the athletes around them before, during and after each of the events was something that we can all learn from. Sara and Amanda both also played strong roles behind the scenes at all of the events, helping organize and promote(and baking for) all of the events in addition to training and competing themselves. The women’s 50-59 category was another hotly contested battle. After missing the Sofie Manerin Loppet, Kelly Bowie spent the rest of the year clawing her way up the rankings to finally claim the title in the last event with a great run at the Gobbler. The husband and wife duo of Linda and Perry Kirkey once again managed to take both 60-69yr categories from afar. This is the second time that the Northbay couple has pulled this off. Lois Luoma easily defended her 70+ Ms. Fit Sudbury title based on her strong run finishes. On the men’s side, Nathan Johnston traveled back from U of Waterloo for the weekend just to put a stamp on his 13-19yr Mr. 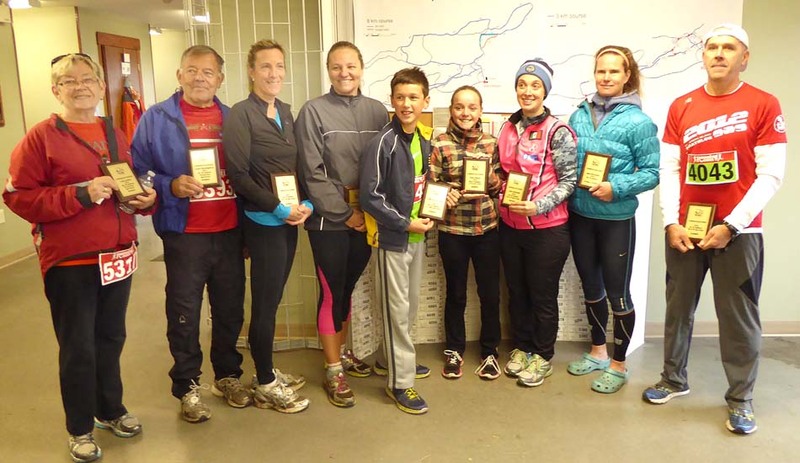 Fit Sudbury title with a great run at the Turkey Gobbler. Despite a rough day at the Gobbler event, Buddy Green was still able to capture the 20-29 yr old category quite handily, finishing 4th overall in the standings. The 30-39 yr group was the one to watch this year with the top two overall men and 4 of the top 10 men all coming out of this group. Kerry Abols and Colin Ward, both high school teachers and coaches, represented their schools well with strong finishes all year long. Marc Nellis came from behind to capture the perennially strong 40-49 title and Todd Withers (the defending overall Mr. Fit Sudbury) finished off an injury plagued year by easily winning the 50-59 category and finishing a very close 3rd overall. Louis Moustgaard was the class of the 70+ field, earning double the points of the 2nd place athlete. He was also 32nd overall out of the 730 men who earned points in the series this year. One of the most exciting age groups this year, for many reasons, was the 12 yr and Under group. This was the first time in recent years that we have seen kids, in both genders, targeting series points and coming out to participate in multiple events to try and win the title. Philippe De La Riva came out on top of a strong field on the Boys side that had all of the top 7 series finishers show up at the final event. The girls field, once again, was even stronger still. Paris Macey led a strong group of girls to become Ms. Fit Sudbury in the age group. 8 girls scored more than 1000 points this year and all of the top 14 girls were on hand at the Gobbler. The strength of this age group is very encouraging and hopefully a sign of great things to come for Sudbury’s endurance sport community. Thank you to everyone who came out to participate in or the volunteer at this year’s events. If you see any discrepancies with the points calculations or have any questions about the 2015 Sudbury Fitness Challenge please e-mail beatonclassic@hotmail.ca . I hope to see you all on February 8, 2015 as the new season kicks off with the Sofie Manerin Loppet at Laurentian University.